In an industry with high potential and high risk, there are some big factors investors need to keep in mind. The solar sector can be an enticing and risky space for investors. There's tremendous growth in the industry and trillions of dollars in potential revenue, but companies come and go rapidly as the landscape changes. Before jumping in, here are three things every investor should keep in mind. Sean Williams: One of the most important things to know about solar stocks is that external policies can have a big impact on the industry. Three really good examples are OPEC's policies, the EPA's policies, and U.S. Solar Investment Tax Credit. Solar panel makers thrive when there's both demand and urgency for their products. This means when fossil fuel prices are high, the urgency for consumers and businesses to switch to solar is there. When crude and natural gas prices fall, solar panel supply can increase and the urgency to make the transition to a green energy solution decreases. Over the past two-plus years, we've witnessed solar panel supply increase and urgency decline as crude and natural gas have hit multi-year lows. However, with OPEC recently agreeing to cut production and crude prices surging on the news, it's possible we could see demand for solar begin creeping back into the industry. Within the U.S., policies from the Environmental Protection Agency can certainly have an impact on the solar industry. Tougher carbon emission regulations have encouraged utilities to switch away from coal-fired electrical generation and toward alternatives, such as cleaner-burning natural gas and solar-powered systems. Of course, president-elect Donald Trump's stance that some EPA regulations and oversight should be pulled back could work against the solar industry in the near-term. Finally, we have the U.S Solar Investment Tax Credit (SITC), which allows for a 30% dollar-for-dollar tax credit on the cost of the panels and installation. In late 2015, the SITC was extended through 2019, providing an impetus for Americans to invest in home-solar systems. The SITC will begin throttling down in 2020 before disappearing completely for consumers by 2023. These subsidies can be a strong tool that encourage or discourage solar investment. As a solar industry investor you'll need to keep your eyes on the policies and subsidies that could impact the valuation of the companies you own. 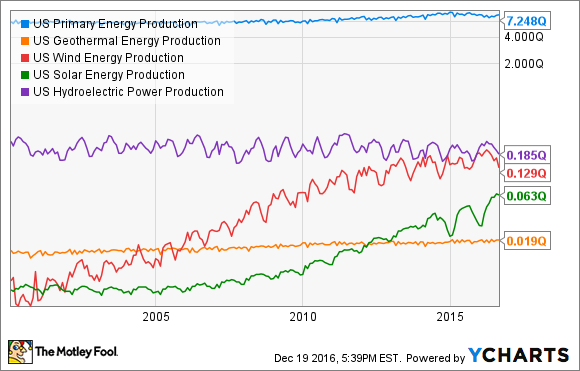 US Primary Energy Production data by YCharts. However, investors must also understand the nature of the solar industry's likely growth to have the best chance at profiting. The best way to understand solar panel manufacturing is that it's a wonderful long-term growth industry, but it will also be highly cyclical from year to year, with ups-and-downs in the short-term even as long-term demand increases. This is particularly true in the utility and commercial/industrial segments, where the amount spent on large, expensive projects can shift dramatically up or down from year to year. At the same time, solar panel manufacturing is complex, expensive, and largely a cost-driven, commodity business. This makes operating leverage critically important, and any solar manufacturer that's unable to respond to shifts in demand before the market shifts can swing from solid profits to steep losses very quickly. It can take time for even the best manufacturers to work through those cycles. It can take time for investments to pan out, requiring discipline and patience, as well as knowledge of which manufacturers have strong operations and balance sheet stability. Solar has a lot of potential, both as an energy source and an investment. But unless you're willing to put in the work and understand the industry and find the best companies, it's also an easy industry to lose a lot of money in. Travis Hoium: Sean is right that policies impact the solar industry's demand more than most industries. And if we want to go more granular we could look at how policies in states like Hawaii, Nevada, and California are impacting the industry on a local level. That's why having a flexible business model is really key to solar companies. Manufacturers need to be able to move supply to where it's needed all around the globe, installers need to be able to ramp up and down depending on demand, and finance companies need to be flexible in the products they offer. One example of a company handling this well is SunPower Corp (NASDAQ:SPWR), the high efficiency solar panel manufacturer. The company sells solar panels into nearly every major solar market, so when Germany was a big installer it had a presence there and now that China is growing it has solutions there. SunPower can also go big or small, providing solutions for rooftop solar customers and utilities looking for massive power plants. This doesn't guarantee success, but it allows a flexibility to change the business as market conditions necessitate. Tesla (NASDAQ:TSLA) subsidiary SolarCity has been on the opposite end of the spectrum. The company is almost completely focused in the U.S. and has tied itself to the lease/power purchase agreement finance model. When states like Nevada change policy the company has to lay off workers and shut down operations. And when customers started demanding loans this year the company had trouble adapting, leading to multiple reductions in guidance. The solar industry changes extremely quickly and that requires flexibility to survive. And some companies are set up to adapt much more quickly than others.